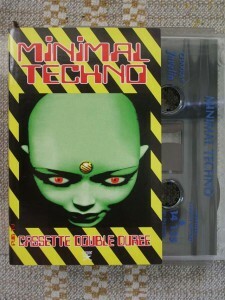 Now for something really dusty, on a tape: Could be the mother of all mid-1990s techno compilations. No time to lean back, it’s a full-on jaw-dropping trip of pulsating and pumping techno. Dating back to 1996, this compilation features landmark techno from many legendary artists and labels like 7th City, Synewave, Kanzleramt, Tresor, Missile and others. They all have a well deserved place in the techno’s Hall of Fame. The highlights are Joey Beltram’s rumbling remix of Gagarin Kongress’s “Astralleib” and “Scissorhands”, a dizzying percussive inferno by Tim Taylor and Freddie Fresh and elegant club fuel by Substractive Synthesis (Damon Wild). Impressive are also Heiko Laux’s “Tundra Effect”, an acidified banger with hints of hard trance, and his classic “No Gain No Pain”. Acid evangelist Woody McBride hits with “Basketball Heroes” that does not need any introduction. If you find any of these on vinyl, get them. Don’t be misled by strange artwork, the compilation put together by French producer Guillaume La Tortue is a valuable history lesson for all techno heads. Although there are plenty of mistakes in crediting the artists and labels, it does not spoil the overall picture. All this beauty is also available on double-CD with even more striking stuff by Regis, Surgeon, Neil Landstrumm and others.